Naming who should get your life insurance money after you die sounds simple, but designating beneficiaries can get tricky. Mistakes are common, and when made, they can be heartbreaking and expensive. When mistakes are made you’re not creating problems for you, you’re creating problems for the people you leave behind. HERE ARE EIGHT LIFE INSURANCE BENEFICIARY MISTAKES TO AVOID. 1. Naming a Minor Child: Life insurance companies won’t pay the proceeds directly to minors. If you haven’t created a trust or made any legal arrangements for someone to manage the money, a court proceeding to appoint a guardian will be necessary. This is a costly process. Instead, you can set up a trust to benefit the child or name an adult custodian for the life insurance proceeds under the Uniform Transfers to Minor Act. 2. 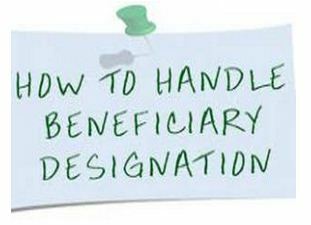 Making a Dependent Ineligible for Government Benefits: Naming a lifelong dependent, such as a child with special needs, as beneficiary puts the loved one at risk for losing eligibility for government assistance. Anyone who receives a gift or inheritance of more than $2,000 is disqualified for Supplemental Security Income and Medicaid, under federal law. Work with an attorney to set up a special needs trust to receive the proceeds of a life insurance policy. 3. Falling Into a Tax Trap: Life insurance death benefits are generally tax-free — except when three different people play the roles of policy owner, the insured and the beneficiary. In that case, the death benefit could count as a taxable gift to the beneficiary. Say, for instance, a wife owns a life insurance policy on her husband’s life and names their adult daughter as beneficiary. The wife effectively is creating a gift of the policy proceeds to her daughter. The person who makes the gift — the wife — is the one who would be subject to a gift tax if the amount of the gift exceeds federal limits. The problem could be avoided in most cases by having the husband own the policy, insuring himself. 4. Assuming your Will Trumps the Policy: A life insurance policy is a contract. Regardless of what your Will says, the life insurance money will be paid to the beneficiary listed on the policy. That’s why it’s important to contact your insurer to change your beneficiary if needed. 5. Forgetting to Update: The designation of beneficiaries of life insurance policies is not a ‘set it and forget it” event. You should review your policy every three years and after major life events, such as marriage, having children or divorce. Change the beneficiaries when circumstances change. Unfortunately, many people forget to do so. It’s not uncommon to find an ex-spouse still listed as beneficiary on the life insurance policy when reviewing a client’s insurance. 6. Staying Silent: The most important thing is to tell someone so they know you have a life insurance policy, where it is and how to find it. Open communication with beneficiaries now can save a family from chaos later – or even worse, never claiming the benefit. 7. Giving Money with No Strings Attached: Naming your young-adult children as beneficiaries without setting any conditions for how the money is dispersed can be a setup for financial failure. How many 18- or 21-year-olds can handle a huge influx of cash? One way is to set up a trust with specifics for who will manage the money, how the money can be released and what it can be used for until the young adult reaches a certain age. 8. Not Naming a Contingent Beneficiary: Most people just think they’re going to make their spouse beneficiary, but don’t take into account that the spouse might predecease them. It’s conceivable that something could happen to you and your spouse together. Sometimes people fail to name any beneficiaries. When there is no living beneficiary, the life insurance benefit typically goes into the estate and is subject to probate. That leads to two complications. One, heirs might face a long wait to get the money. Two, the life insurance proceeds, which normally would be protected from creditors, now can be used to pay off creditors of the decedent. It is recommended that you name secondary and final beneficiaries. If the primary beneficiary dies before you do, then the money passes to the secondary beneficiary. If the secondary beneficiary has passed away when you die, then the death benefit goes to the final beneficiary. If you have any questions about your designation of life insurance beneficiaries, or need assistance with any other aspect of your life insurance policies, contact us to schedule a phone consultation. Learn more about avoiding other estate planning mistakes in our related post on the Ten Most Common Estate Planning Mistakes. Find out how we can help you with all your estate planning needs.